We need to get dressed. 4. Sunglasses. Girard 3700s. If you weren't one of the lucky dozen to get a pair of the same frames worn by Bradley Cooper in American Hustle, we have five more pair of the red-framed ones. Not every man is capable of pulling these off, but if that's you, you'll look like a million bucks. Q: It's almost time to pack the corduroys away depending on where you live (sorry New England). So, what would you say are some essentials for spring? 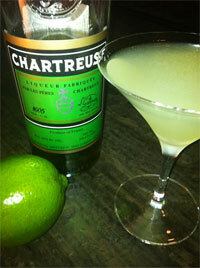 There is no cocktail that personifies and embodies spring more than The Last Word. Equal parts gin, Luxardo maraschino liqueur, Green Chartreuse, and fresh lime juice, one sip of this emerald Prohibition-era tipple immediately conjures thoughts of tournament basketball, The Masters, green grass, and swallows returning to Capistrano. It also serves as an excellent alternative to green beer, the toolbag drink of choice tomorrow. Spring means baseball, and Opening Day is the opening day of the newly-expanded white pant season (more on this later). The Cardinals play at Wrigley in just 20 days. The best place to find something cool, unique, and cheap is YOOX, as usual, and free shipping is now standard. Otherwise Levi Strauss & Co. makes white denim in the 501, 511, 514, and 569. Our favorite purchase of 2015 by a wide margin. Is $275 a lot for a cotton sweatshirt, even if it's made by Canadian factory workers using Japanese indigo? Yes. But while this garment is marked 100 percent cotton, we actually suspect it might be 120 percent cotton, or maybe even 125 percent. It's that soft. Paradoxically, it's also incredibly sturdy. In fact, we're betting its tank-like construction will yield a life expectancy of at least a decade. Amortize its cost over that term and it's actually cheaper than a $15 Old Navy sweatshirt that you will be downgrading to "paint rag" by Independence Day. During the chambray boom that happened a few years ago, when folks were making pants, suits, and even a few trendy hotels out of chambray, we did not buy in heavily. Indeed, we think chambray is a little like heroin or Jim Carrey — something to savor in small doses. But when it's used right it can be very effective. Here, for example, a splash of chambray gives these Tretorn Nylites — originally invented in 1964 and typically made out of a canvas — thinking about April matinees at Target Field. So make ours a double! Insta-Spring has us recalling one of our favorite Onion pieces, this one from 1996: Area Students Prepare Breasts for Increased Springtime Display. "Female college students from across the northern U.S. celebrated the improved weather this week, preparing their breasts for the increased exposure and display that the warm weather now demands." Q: If you have nasty feet and shouldn't be wearing sandals, what do you recommend with shorts? Some Pumas with low socks? Thanks. A: Over the last three decades, thousands of Vietnamese immigrants have journeyed across oceans in boats we'd be afraid to board in a wading pool just to make your feet presentable in sandals. Get a pedicure! And if you think that sounds kind of girly, do you know who else gets pedicures? Lions! Well, circus lions anyway. And if it's man enough for them, it's man enough for you too. And what if you have some kind of physical deformity a pedi can't cure? You're on the right track. We prefer anything vintage from Puma, Tretorn, Adidas, with no-show socks or none at all. You'd have a hard time going wrong picking just about anything from Classic Sport Shoes' Adidas Originals page. Q: I recently bought a pair of the classic canvas Tretorn tennis shoes. Super gay or totally bastardly? A: While we prefer Tretorn Nylites on our female models, especially when their cheerleading skirt is blowing up in the air, we dig them for men as well. We hope you chose the white with the white Gullwing logo because the white with yellow is super gay.